This entry was posted in CODOX=M/IVAC, Lymphoma, Recovery and tagged Thanksgiving Planning by Annie Modesitt. Bookmark the permalink. It sounds like you’ve got this visit thing nailed. Maybe you can get a job consulting on room layout when you’re feeling better? 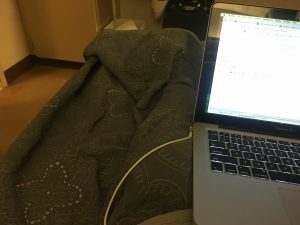 You can work up a questionnaire for the nurses to fill out about how your room design works for them and use it to develop a second (or would it be a 7th?) career. Meanwhile I’m spinning that prayer wheel for you with love and smiles. I was just thinking about you. I’m so happy to see you’ve posted. Wishing you all the best. Keep on keeping on. Everyone is pulling for you. I’m across the river holding good energy and light for you. One of the BEST things we’ve done is get our turkey from Whole Foods. No getting up at 0dark30 to get it in, worry if it’s done yet, etc. Theyre good, done well, and save your energy! May you not have cause again to utilize the amazing skills you’ve earned about gaining relative comfort in a hospital environment. I’ll be thinking of you all on Thursday. You are amazing. What a tough time. I love your honesty and appreciate your upbeat attitude — when it is there — and your frustration and grief — when that it what you are going through. I wish I lived near you ( actually if you lived near me as it is warmer in California) so I could be part of your brigade.takecare. Sleep lots. Laugh when you can. Pet animals. It is so good to hear your voice again! And… You’ve got this. Warm wishes and prayers for a beautiful Thanksgiving at home with your sweet family. I hope this week is as gentle to you as is possible. Glad you and Andy and Max will have your own Thanksgiving, together. I’m sending positive energy your way in hopes that you will feel like celebrating. You are a true warrior — an inspiration. Like I said before – just “Do YOU!” All of you will find your own way through this time which must certainly feel like a surreal nightmare to each of you. It sounds like Andy is trying hard to fill your shoes. I think you’re right on the mark with order-in whatever can be ordered, and tell her what a fantastic job she’s already done!! I know you have already done that probably a dozen or so times. So glad to hear from you again. We’re all still right here. I’ m so happy you have brought a bit of home with you! That is healing in itself ! I love your take charge attitude in rearranging your room, do what you need to make this place comfortable for you. perhaps we need to put you in charge of hospital design. Sending love and comfort, Annie. And such gratitude that you’re almost done with the chemo journey. We are very glad you’ve got the blend of comfort items that work for You! (for M it’s her socks, her & foam earplugs! We both hope this stay goes quickly & easily for you. I am also thinking of you and hoping your December is ok. Hugs.